Heal Your Puzzle » Blog Archive » Building Resilience… Struggling with something? … It’s not all your Fault! 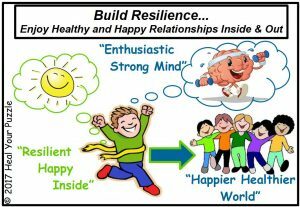 Building Resilience… Struggling with something? … It’s not all your Fault! Everything I write about here on this page is a way for me to help you build your resilience. If you are more aware of how you think or how we as people function then I hope that you can better understand yourself and others. With understanding comes more acceptance and may inspire interactions to be done in a more empowering way for all involved. I have come to realise that much of how we behave is deeply ingrained in us from our heritage – our cultures, genetics, communities, our own life experiences and from observing others. What I have also realised is that we are all also very good at adapting to our environments… if we are frightened or challenged, we somehow adapt to fit in which can sometimes unfortunately be in a form of surrendering or compromising aspects of ourselves. Of course we can also rise to the challenge and decide to shape our lives into something more positive and driven by our own Truth… I touched on this last month when talking about Personal Values… did you realise any Values that were missing from your life last month? Even though they are important to you? Still you feel unable to bring them into your life? Health and Wellbeing Implications It is not anyone’s fault that we are embedded in certain Blueprints, it is all just inherited! The increased yearning for a positive free life which has grown over the last few decades is causing greater conflict within and the greater the possible detrimental effects to our health as our bodies and our cultures try to adapt to the dis-ease which is manifesting… perhaps this is contributing to the global Terror threat and also the increase in our debilitating, harder-to-treat illnesses and the increased concern over our mental health.